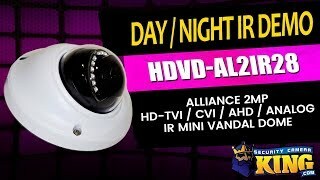 Our latest Alliance series vandal dome replaces our previous Techpro (TP) version. The same quality camera that has become a favorite with many of our customers will continue to deliver beautiful, crisp, vivid video in 2MP/1080p resolution. Because this is a QUAD camera, you’ll enjoy the versatility of being able to use this camera with four different technologies that offer the same high definition video. Enjoy CVI, TVI and/or AHD technologies in 1080p in real-time 30fps. With that many options it should be simple to integrate this with your existing DVR and security system but, if you need to replace your DVR we have plenty of solutions available for you. This is a nice compact design that gives you tons of flexibility when you are trying to determine the placement of your cameras. A 2MP CMOS Sensor helps to ensure that you have crisp and clear video while the 2.8mm fixed lens gives you a great wide view of larger areas or smaller, more compact areas when you move the camera closer to your area of focus. Either way it’s a great camera for both commercial and residential applications. This camera is even equipped with built-in LEDs that give off IR (infrared) for up to 65 feet away from the camera, allowing you to see in low-light and even total darkness. Besides the quality of the camera and the fantastic price, one of the best things about this and our other HD cameras is the fact that many people will already have the necessary cables in place that you will need to connect the cameras. If you have had Analog cameras in the past, you probably have coaxial cable and a 12V DC power supply in place. If not, we have Siamese cable available that has the power and coaxial together on one cable. These cameras include a one year warranty, FREE US based tech support and FREE remote monitoring apps!